24/7 Hotwater Direct is more than just a Hot Water System Supplier. 24/7 Hotwater Direct can receive your phone call 24 hours day, 7 days a week and you will talk directly to a hot water technician. Our technicians analyse and source the most efficient and cost effective HWS to suit your household needs. 24/7 Hotwater Direct take the stress out of installation by organizing a licensed plumber for immediate install, organise and liaise directly with any other tradespeople who may be required i.e. electrician. Our experts test all units to ensure they are running correctly and provide a certificate of compliance. Once we have ensured everything is in correct working order we remove your old system and take it away. 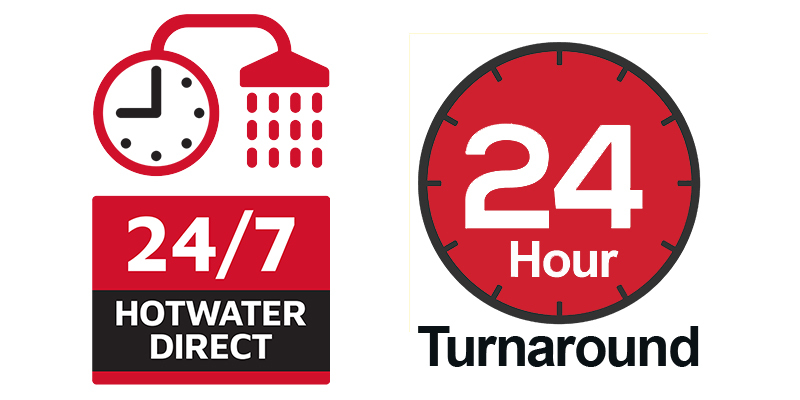 Our 24-hour turnaround has resulted in 24/7 Hotwater Direct becoming the market leader in hot water replacements. We take the stress out of replacing your hot water system by offering one complete solution.